The old colonial town of Caracas can be found in the city’s Centre district. The downtown area is called El Silencio, where architectural gems from the 17th and 18th centuries are proudly preserved. Of huge interest here are the National Pantheon, which is the resting place of important Venezuelans; the Casa Natal, where Simón Bolívar was born; the grand Catedral Metropolitana de Caracas, built in 1665; and the 17th century La Casa Amarilla, which was once a prison and now houses the Ministry of Foreign Affairs. Prior to its redevelopment in the 1940s, El Silencio was overcrowded and public safety was poor. 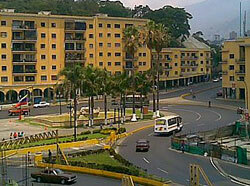 It owes its modern urban design to award-winning Venezuelan architect Carlos Raúl Villanueva. Aside from the notable architectural works, the area now has green spaces, parks, community playgrounds, and safe pedestrian thoroughfares. The old quarter La Pastora provides a window to the Caracas of days gone by, with its simple homes with patios and gardens that are fine examples of southern Spanish-style architecture. Sadly, this area is deteriorating. In the neighbourhood of La Candelaria, the colonial church and square are picturesque, and there are many Spanish restaurants and lively bars. The streets, however, are taken over by numerous stalls and can be quite chaotic.